To fill the void left with Michael’s departure I’m gathering a few thoughts about yesterday’s exciting fourth day of the festival. It’s early Friday morning as I write, and the wedding is happening. On the local CBC station Sylvia Tyson is talking about her debut novel, Joyner’s Dream. Next half hour Charles Foran will talk about his great biography of Mordecai Richler and his more recent short biography of Rocket Richard. Sylvia is still in town for her main events today, whereas Charles is moving on to Montreal and that other festival. Last night close to 800 people filled the Capital Theatre for our annual Soirée Frye. Hosted by Festival Chair and ambassador extraordinaire Dawn Arnold and newly crowned Poet Flyé Gabriel Robichaud, the event featured readings by poet Dyane Léger, novelist Shandi Mitchell, novelist and Prix Goncourt winner Gilles Leroy, and Margaret Atwood. Throughout the evening Marie-Jo Theriault and Joe Grass provided a magical musical background, and sometimes foreground. Very strong performances by all four readers! Margaret Atwood opened by saying that she was a student of Frye, and that she would talk more about that time in her life when she delivers the Antonine Maillet-Northrop Frye lecture Saturday evening. (It’s at the Capital Theatre at 8 pm, and will again no doubt be packed to the rafters.) If Frye could see what is happening in Moncton in his name, he would be, Atwood said, “bemused, delighted, or … something.” (That ‘something’ was quintessential Atwood, I think everyone felt. I did.) She read from Oryx and Crake, in four perfectly modulated voices, demonstrating a dramatic flair that surprised me and left all of us wishing for more. The reception afterwards, in the lobby, lasted an hour, with everyone feeling they had just witnessed, or taken part in, something special. I musn’t forget to mention the thoroughly enjoyable ‘Book Club’ event with Shandi Mitchell at 2pm Thursday, featuring her wonderful novel “Under This Unbroken Sky.” And at 5 pm, at Navigator’s Pub (scene of Michael Happy’s successful ‘Frye for Beginners’ presentation), the Iranian writer-in-exile Fereshteh Molavi talked with Thomas Hodd, a new member of the Frye Festival team, and gave us much insight into the immigrant experience, from the point of view of a single woman trying to make her way as a writer. Not easy! To say the least. 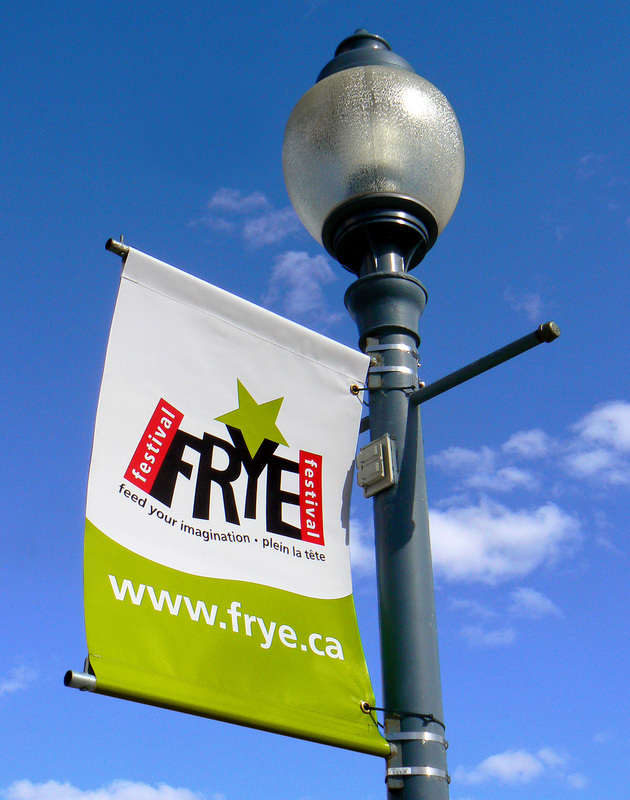 Thursday was a great day, as we reached the halfway point of the 12th annual Northrop Frye Festival. Our intense program of authors in the schools is going very well, from what I hear, with one or two exceptions – when a classroom is perhaps not prepared to receive the author. Today, Friday, promises to give us much more to ‘feed the imagination.’ Saturday, ending with Margaret Atwood’s talk (entitled ‘Mythology and Me: The Late 1950s at Victoria College”), will bring it all to a very high, even exhilarating pitch I’m sure. My only regret is that Michael is not still here to record and observe it all. This entry was posted in Frye Festival on May 1, 2011 by Ed Lemond.